I purchased little cable dots to partially control cable organization on my desk. 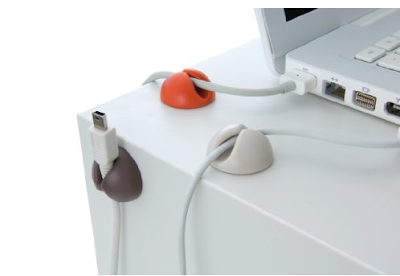 These wonderful little dots do an excellent job of keeping my cables from disappearing. But I recently saw a very clever variation on this idea. 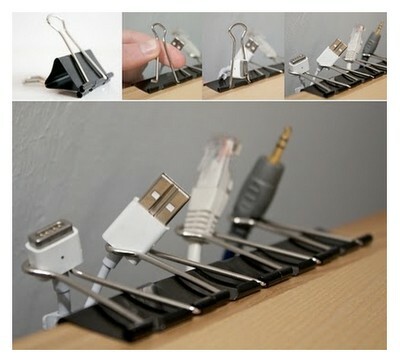 I will now think of binder clips from an entirely different perspective. I am sure that I'll find other out-of-the-box ideas. I think I am on an organizing kick. I find I have been spending more time at organizing sites and I know the messy areas in my house. Maybe I'll get inspired to address those issues! 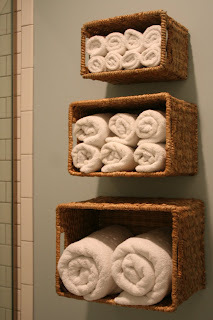 Check out this towel organization system from inexpensive baskets that I found over on I'm Busy Procrastinating. Simple, inexpensive, functional and it looks great!